TORONTO - The Chinese are coming. After years of predictions that made-in-China electric-car technology was poised to dominate the global market, the country's battery-powered cars will be driving on Canadian streets in a few months' time. To anyone already shopping for an electric vehicle, it's not a surprise that consumers can't easily opt for one as their next family car. Despite attempts by various levels of government to encourage us to go electric and a sharp rise in annual sales, even familiar brands of battery-powered vehicles, such as Tesla and Nissan Leaf, and plug-in hybrids, like Toyota Prius and Chevy Volt, can't seem to keep up with demand. But that's not the reason you won't be able to get your hands on a car built by Chinese automaker BYD — the company best known in investment circles for its famous North American shareholder, Warren Buffet, who, along with his Berkshire Hathaway holding company, is BYD's biggest private-sector investor. It's because the car in question — the BYD E6, pictured above — is currently being adapted to Canadian safety and charging standards. 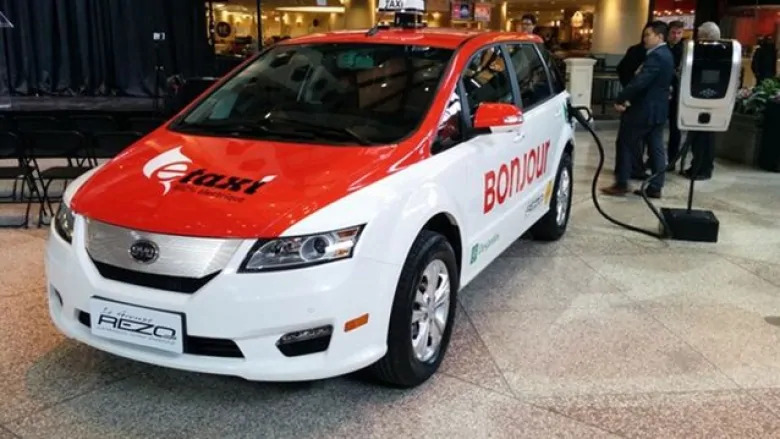 But a fleet of E6s should be operating as taxis in Montreal in the new year, according to Martin Archambault, of the Quebec Electric Vehicle Association (AVEQ). "They're starting a new electric-car taxi company," said Archambault. "Only using BYD cars." While we have yet to see its vehicles on North American lots, China is on its way to becoming the Detroit of the battery-powered automobile industry, according to engineer and electric car expert Matthew Klippenstein. In addition to supplying its own enormous domestic market, Chinese electric cars are about to spread around the world. And just as North American carmakers were caught unprepared, losing out to Japanese and European brands when the oil crisis of the 1970s led a rush to smaller, cheaper cars, Klippenstein says there is a danger of history repeating itself with electrics. "American manufacturers … got used to making big, huge boats," he said. "They thought oil was going to be cheap forever." Japanese car companies in particular — including Honda, Toyota and Nissan — filled that gap. And despite cars that initially suffered from what Klippenstein calls "horrendous" quality defects, those errors were quickly overcome. "They got a foothold, they got a loyal customer base, and grew from there," he said. The quality of some Chinese-produced batteries has been roundly criticized in recent years. And Klippenstein says the safety standards of many Chinese-made cars may not yet be up to European and North American standards. Still, their lower cost has already given them an advantage in developing markets, including Indonesia and Brazil, he says, at price levels where North American and European manufacturers have trouble competing. One of those price advantages comes from the fact that North American carmakers pay for the cost of their research based on much smaller sales, whereas China can spread that cost over an enormous volume of domestic sales. Canadians may right now scoff at Chinese manufacturing quality — but we also scoffed at the quality of the first Korean car sold in this country: the Pony. That was quick to change as Hyundai proved itself by improving quality while keeping costs low. And older Canadians will remember a time when "Made in Japan" was not the recommendation it often is today. Price, of course, is an important consideration. Even though most calculations show that an electric vehicle's lower running costs — electricity being cheaper than gas, and the maintenance less costly — pays back the higher purchase price within four years, the price of North American electric cars has so far been a barrier to sales. You may already be driving a car containing Chinese technology without even realizing it, according to David Adams, president of the Global Automakers of Canada, an industry group that represents car brands outside the Detroit Three. "That's what's happening with a lot of the Volvos that are being made in China right now and being put into the Canadian market," said Adams. Volvo, the Swedish brand that is widely known for its safety, has been owned by Chinese car company Geely since 2010. To maintain quality in the luxury marque, Geely is using Korean-designed LG batteries made in China. Volvo has promised to offer electric versions of all its cars by 2019. And as it moves toward that target, its best practices will be shared by its Chinese parent. So long as North American-made electric vehicle prices stay high, the six per cent tariff on imported electric cars from China will be manageable, if they can keep their costs down. Ted Dowling, BYD's vice-president for Canada, says he can't talk about when his company's cars will be available to the public in this country. But BYD is expanding its footprint here. The company already has contracts to sell its all-electric buses in several places in Canada, including to the Toronto Transit Commission and to a Vancouver-based sightseeing operation. The TTC deal is still on despite the change in government at Queen's Park, Dowling says. And plans for a Canadian assembly facility are underway, he says, but he can't say where yet. As for the BYD vehicles heading to Montreal, Dowling calls it "the best-selling electric taxi in the world." The vehicle's battery pack should last a full day of Montreal driving, he says, and while the purchase price is high, as with other vehicles made for use as taxis, maintenance costs will be much lower. Plus, Dowling notes, the payback rate for heavily used electric vehicles — including taxis, buses and trucks — is much faster than for consumer cars simply because they are on the road for so many hours a day. And his thoughts on the quality of Chinese-built cars? He says he's driven them, they're good and he can't wait until they reach the Canadian consumer market. "If you look at the new cars that BYD is building now, they're just as good as anything else that's on the road today," said Dowling. "I want to drive one here." But, of course, that's what you'd expect him to say.